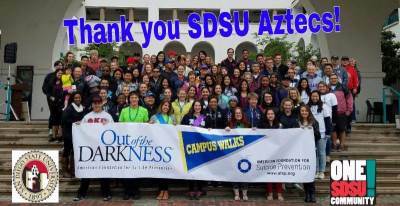 The SDSU Out of the Darkness Walk is a project of the Greek Life Join Us Series: Mental Health Education and Awareness and the One SDSU Community initiative. In conjunction with the American Foundation for Suicide Prevention, SDSU is host to the inaugural campus-based Out of the Darkness Walk on April 30, 2016. Campus partners from across SDSU have come together to coordinate this event and awareness around this critical issue that affects so many. With the Walk, the committee seeks participation from all areas of campus life: Fraternity & Sorority Life, Counseling & Psychological Services, Residential Education, Pride Center, Women's Resource Center, Veterans Center, Associated Students, Student Organizations & Activities and more! 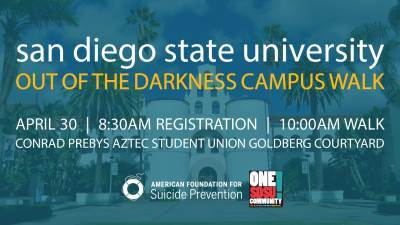 Click here to go to the SDSU Out of the Darkness registration page.